How do I invite people to sign up on my Group Page? There are several options for inviting people to your Group Page. 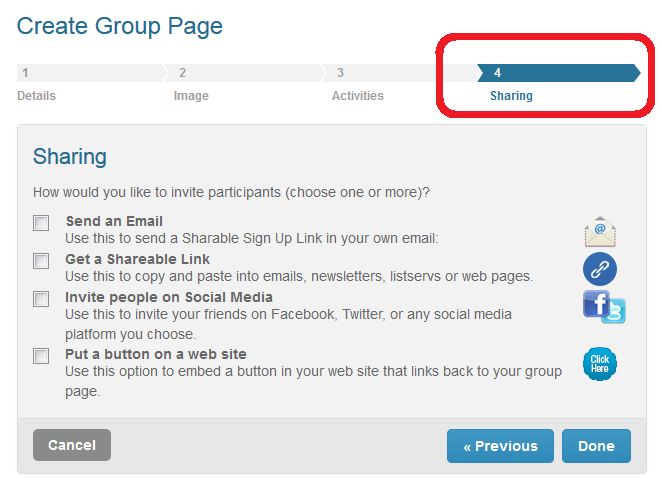 First, Create or Edit your Group Page and proceed to Step 4, Sharing. Then you may choose from copying invitation text to paste in your email or eNewsletter, text for sharing on Facebook & Twitter, and an HTML button you can add to your website or blog. Choose as many options as you like. If your Group Page has been published already, open your Group Page Dashboard, then for your Group Page, select Manage then Next to pass options 1-3 and get your information from step 4 (Sharing). NOTE: To send invitations to participants across multiple SignUps or those associated with the SignUps posted on your Group Page(s), please choose Advanced Messaging from the My Tools Menu. Can I embed my SignUp Calendar or Group Page on my website? Can I send an Invitation to Multiple SignUps or to participants invited to Group Page SignUps? How can another organizer post a SignUp to my Group Page?